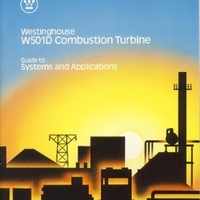 This manual was produced to provide customers with a useful source of information about the Westinghouse W501D5 100MW combustion turbine (a.k.a. gas turbine) power-generating unit. The information describes the various subsystems comprising the packaged power generating unit (called the Westinghouse ECONOPAC') and also provides all of the performance data and correction curves for application of the W501D5 to customer's specific projects. The W501D5 was an improved version of the prior W501D design, introduced in 1980. Original 28-page manual, 1983: Item SA 11321-A, Westinghouse Electric Corporation Archives. Digital reproduction of original 28-page manual, 1983. Scalzo, A. J., G. S. Howard, P.C. Holden, and J. Morrash. "Westinghouse W-501D 100 MW Single Shaft Heavy Duty Combustion Turbine." International Power Generation, October 1980. “Westinghouse W501D Combustion Turbine: Guide to Systems and Applications.” RICHES of Central Florida accessed April 19, 2019, https://richesmi.cah.ucf.edu/omeka/items/show/6596.